What is the role of the facilitator in a rhizomatic space? We’ve heard lots of interesting suggestions… jester, convenor, teacher, leader… my guess is that, in the final analysis there will a more complex answer than any of these, and, appropriately, the answer with be multiple and something mapped out during each successive attempt. God forbid we should ever approximate a final analysis. Education will be over. This is, perhaps, the major finding of rhizomatic learning. Again, Jenny, I thank you for posting these findings and insights. Excellent work. Hi Jenny! Hope the comment works this time! I shall try again. I think that are some ‘core issues ‘ here with identifying ‘core’ groups in a rhizome. Do you consider yourself(ves) as ‘core’? ‘The pragmatists vs theorists’ debate strikes me to be identified here by you as important as ‘core’. Why? If you consider all the visib le activity (I imagine you are I or anybody would be quite incapable of curating all the activity visible or not) associated with this course how do you make a selection? ‘Discussion’ within the ‘FB’ group was ‘quickly passed over’ – how do you know? Is ‘discussion’ important and is it necessarily visible? I would suggest that you are quickly passing over what is an ongoing discussion for the sake of quickly publishing something. ‘A feature of ‘rhizo14’ was a ‘core group’ ‘fb group’. If you concentrate on ‘groups’ rather than networks are you not missing the message of ‘rhizomes’ which have no ‘core’? Why do you insist on ‘visible activity’ over an artificially imposed time frame when (if I understand this rhizome metaphor) what is important is most often not visible.? ‘An active participant’ – how do you measure activity (and is apparent activity the adequate lens with which to study rhizomes?)? I agree with you that there is a problem in concentrating on ‘groups or ‘communities’ when a rhizome is a ‘network’. ‘Was there mulitplicity?’ – how do you define multiplicity? If you concentrate on ‘core groups’ ‘key or most active contributors’ you are unlikely to be able to easily visualise ‘multiplicity’ or absence of ‘central pivot’ because you are yourself fixed on what you consider (wrongly) a central pivot( a core group). If one considers for a moment Dave or D&G or Keith as central (key) then are you not missing the point of multiplicity? As Dave points out in his comment and as D&G or Keith repeat: WE ARE mulitplicities. I agree there is an issue with your research concerning ‘ruptures’ or ‘lines of flight’. If you look at categorising people (nodes) as ‘early leavers’ what is ‘early’? and what is ‘leaving’? ‘The territorialisation in the form of the FB group was ‘dominant’. How do you define ‘territorialisation’ or ‘dominance’? I have the impression that you are concerned about a particular ‘territory’ and a particular type of ‘dominance’ what is it? How do you identify the FB group? All members? Are ‘core nodes’ the most ‘active posters’ or the most ‘connected posters’? or other? Do peoples perceptions of ‘connection’ determine ‘connection’? I can imagine that I am ‘key’ or ‘a member’ or ‘disconnected’ but the fact that I voice it in a space within which you can be witness tosuch a perception of ‘disconnection’ would suggest CONNECTION. 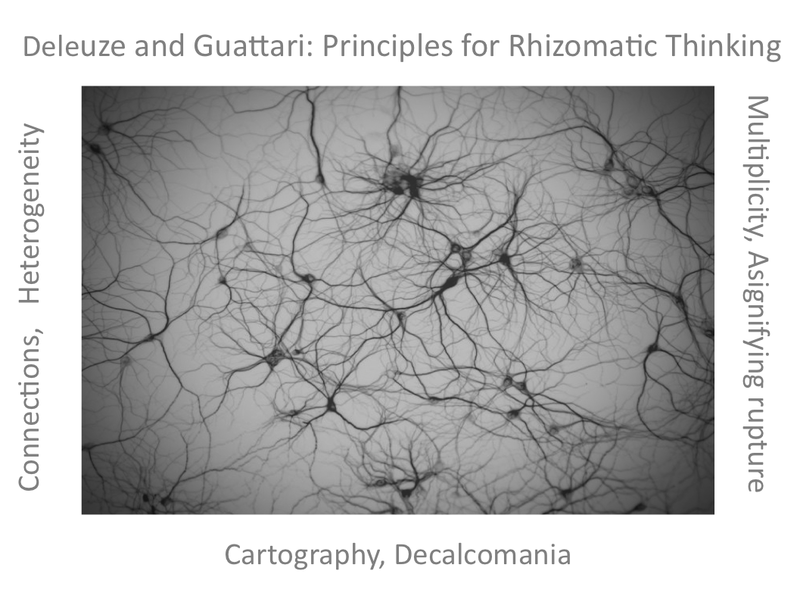 How can we be ‘within’ a ‘rhizome’? Is a tweet with three hashtages: #rhizo14 #clmooc #clavier within rhizo14 or without? ‘Traditional ways of thinking’ – whose traditions, what traditions, what sort of thinking are you referring to? ‘This discussion around rhizo14 continues albeit in one space’. I imagine that you are not suggesting that your blog is the ‘one space’ so clearly what you are suggesting is demonstrably inexact. I look forward to continuing the multiplicity of connections across a multiplicity of spaces via discussion, silent contemplation, vocifierous hiphop poetry, laughter, dreams and wonder. I look forward to reading your posts as they enable me to think differently to my ‘traditional way of thinking’. Thanks for your interesting and long comment lots to ponder, Simon. I am going out just now, but as you said recently in another context “I’ll be back”. @simon Here is the link to my views expressed recently on scientific and ‘other’ research, and the messy process of research http://francesbell.wordpress.com/2014/05/27/the-best-laid-plans/ Note this was not a joint post between me and Jenny like this current series so probably better for you to reply there if you are so moved. Simon – thanks for all the comments and careful reading of the posts – very timely given that we may get similar questions and responses when we actually give our presentation on Friday. I can only speak from the view of my experiences with #rhizo15 as I wasn’t aware of #rhizo14 (or only vaguely aware) – so this doesn’t really add to your research, but may provide a little insight from a newbie participant’s perspective. I think the lens with which you view participation needs to be considered as well. I’ll keep poking the bear of “continuum of emergence” here – some participants aren’t in the place of “theorectical research into pedagogy” or the philosophical writings of D&G – either due to time constraints, where they are in their career development, or any other number of competing interests…this doesn’t take away from their interest or value as a participant in cMOOCs. It may, however, lessen their desire to participate in conversations heavily slanted to those topics. A community college faculty’s interest in exploring cMOOCs will probably be totally different than R1 faculty which will be different than Ed Tech people, etc., etc. So, as a very busy eLearning Director at a community college, I dip my toes in the conversations – not caring about the platforms – that either a) interest me personally or professionally, b) will be of use to me professionally, or c)where I can contribute something to others. That doesn’t mean I feel either included or excluded from any particular thread – whether on Facebook, Twitter, or a blogpost – it means that’s where I chose to spend my limited amount of available time (like here 🙂 ). Biggest bang for the free time buck, so to speak. That being said – there clearly are relationships – those who “know” each other from Twitter or from the previous Rhizo. But that happens in any class…students mingle with students they’ve been in class with before. I’m not sure that it is a negative – it just IS. Thanks for providing me with some food for thought! And now, I am late for a meeting…lol.